As Earth Day draws near this month, I want to really focus on companies that have made the conscious effort to be green EVERY DAY of the year! One of the best leaders and overall examples in the "green" world is the The Ultimate Green Store! As the ultimate web-based destination for eco-conscious shoppers, The Ultimate Green Store provides a collection of many of the finest environmentally friendly products for you, your home, office, kids and even your pets! They also have an incredible collection of gifts for any occasion and you may personalize your shopping experience by creating a wishlist or custom gift registry for your special event! They carry products from many of the world’s leading manufacturers and designers of sustainable, natural, organic, recycled, eco-friendly goods- products that are made with your health and the health of our planet in mind. Many of these companies are amongst the most socially responsible companies around. We also carry some green products made by companies that did not start out with environmental concerns in mind, but now realize the importance of sustainable practices and production in launching green lines within their category. We hope that in supporting these manufacturers, they will continue to move in this positive direction. 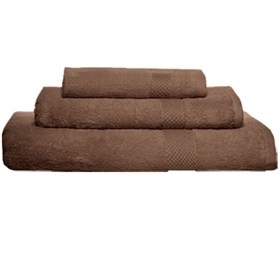 I generously received the Organic Combed Cotton Towel Set in Chocolate (1 Wash Cloth, 1 Hand Towel, and 1 Bath Towel). These 100% Organic Combed Cotton Towels are made with 100% GOTS Certified Organic Cotton. Low impact dyes are used in the coloring of these towels, meaning the lowest possible environmental impact. The towels have also passed Oeko-Tex certification to make sure they do not contain harmful substances, and are produced in the most environmentally friendly method possible. Crafted to plush perfection, 100% Organic Cotton Towels offer durable construction, ultra-absorbency, and a naturally luxurious feel. These towels are made from the finest organic combed cotton, which means all the shorter and breakable cotton fibers have been combed out, producing an extremely soft and lasting towel. Each Towel set contains 1 Wash Cloth, 1 Hand Towel, and 1 Bath Towel. The perfect combination for your eco-home! 1 Wash Cloth - 13" x 13"
1 Hand Towel - 15" x 30"
1 Bath Towel - 30" x 56"
I absolute love the great organic towel set I received! The towels are a very generous size (as you can see in the pic above, it is almost the size of my couch!!) and they are SO SOFT!! I love organic towels so much because they are always the softest towels in my closet/bathroom! The towels are a little thinner than other organic towels I own, but they make it up in softness and size! I love the deep brown color - they match perfectly in my bathroom! These towels are the ones I reach for when I get out of the shower and I love giving them to guests to use because they love them too!! If you want to find one of the greatest selection of all items "green", then head to just one site: The Ultimate Green Store! You will find all your favorite green brands and items in ONE place! Buy It: You can purchase the Organic Combed Cotton Towel Set for $58.95 on The Ultimate Green Store website. Win It: The Ultimate Green Store is generously offering (1) $20 gift certificate to a lucky winner to shop their huge selection of eco-friendly products for the home, babies and kids!